Natural History Museum Vienna 2019: Admission prices, opening hours, underground. The Natural History Museum in the centre of Vienna is one of the most important museums in Austria and one of the most important natural history museums in the world. The huge museum opened in 1879, as did its sister building with the Museum of Art History opposite, but many objects in the Natural History Museum, such as the collection of insects from the 18th century, are much older. On the one hand, the zoological department in the Natural History Museum Vienna inspires many visitors. The many insects and larger mammals are some of the highlights. Other rooms with huge extinct animals, such as gigantic dinosaurs and rhinos, are definitely worth a visit. Very well known are also the geological sections such as minerals and gems. We found the world-famous collection of meteorites in the Museum für Naturgeschichte in Vienna very interesting. Also plants are shown in detail in the museum. Examples are flowers (blossom plants), different kinds of wood or fruits and seeds. The museum area for ecology and nature conservation is relatively new. The most famous find of the exhibition is a stone figure from the Stone Age. It is the almost 30,000 year old Venus of Willendorf. In the village of Willendorf, in the north of Austria, the figure was found in 1908. Adults pay 10 Euro entrance fee. Students and trainees up to 27 years can visit the museum for 5 Euro. There are other discounts, for example for the disabled and senior citizens (8 euros). It’s great that children up to the age of 18 have free admission (information as at the beginning of 2018). We think that the entrance fee for the natural history museum of 10 Euro (as of the beginning of 2018) is reasonable. It is a large and very interesting natural history museum. In our opinion it is the best exhibition about nature in Europe. The Museum für Natur is located in the centre of the city of Vienna. The nearest underground station is „Volkstheater“, less than 100 meters away. Two underground lines stop here: The subway U2 (dark blue line for example directly to the Prater) and the U3 (orange lines, directly to the Stephansdom and to the important railway stations Wien-Mitte and Westbahnhof). 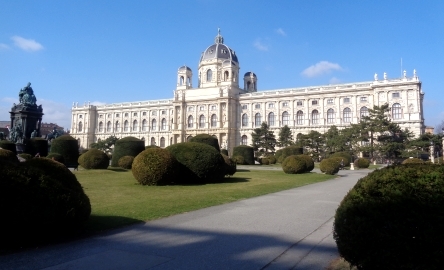 Other sights of Vienna are only a few minutes walk from the Natural History Museum. These include the Hofburg, the Spanish Riding School, the Albertina (Museum of Art), the Austrian National Library and the above-mentioned Museum of Art History Vienna (Museum of Art History). Tuesday is the day of rest for the exhibition about nature in the centre of Vienna. To our knowledge, the largest museum in Germany on a similar subject is the Museum of Natural History in Berlin. There is also a museum of natural history in Venice. However, the exhibition in Vienna is many times larger.